As current political turmoil in Washington threatens to bleed into the ratification of a new regional trade pact between the U.S., Mexico and Canada, JPMorgan Chase & Co. sees the Canadian dollar getting caught in the crossfire. The bank now expects the Canadian currency to weaken to $1.35 per dollar by the middle of 2019, having previously forecast that it would be around $1.30. A key reason for the pessimism is the fraught outlook for the passage this year of the U.S.-Mexico-Canada Agreement, according to analysts Daniel Hui and Patrick Locke. Ratifying the pact will be “bumpier” than most investors realize given the deep fissures within a split U.S. Congress, as well as an ongoing partial government shutdown. The Canadian dollar tumbled almost 8 per cent against the greenback last year, the second worst performance among Group-of-10 currencies. A rebound in oil prices has helped the loonie strengthen about 2.8 per cent against the dollar this month to $1.3270. 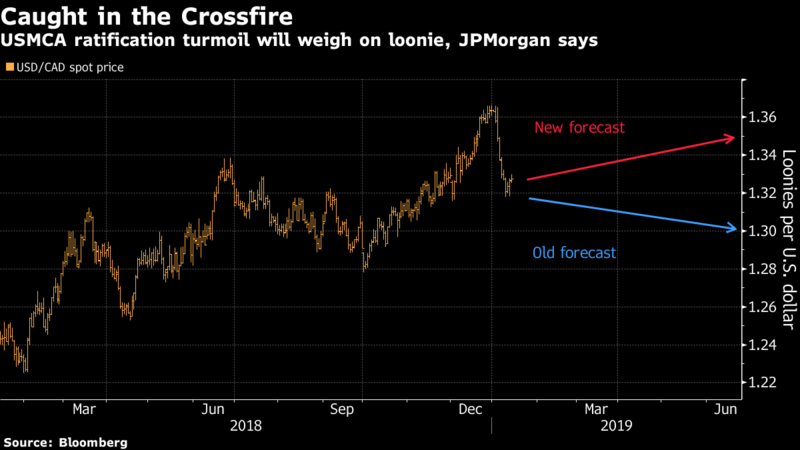 While JPMorgan expects the pair to touch $1.35 in the second quarter, the analysts believe the currency will finish 2019 at $1.29. Hui and Locke forecast a 70 per cent chance that the trade pact is ratified in 2019, a 20 per cent chance that talks “muddle through” in 2020 and a 10 per cent chance that the deal collapses. While passage is the most likely outcome, JPMorgan warns that the process will be “noisy” and could see U.S. President Donald Trump initiate a withdrawal from the North American Free Trade Agreement in order to force a vote on USMCA.